July 13, 2017 - Fire ants have the ability to form tower-like structures through trial and error. These towers can contain hundreds of thousands of ants, reach 30 ants high, and form with no clear leader. They employ a bell shape, like the Eiffel tower, to ensure each ant bears an equal load. When one section becomes overloaded, it collapses, and the ants scramble to reform. This process continues until a stable structure is achieved. The tower serves as a base of operations and even acts as a shelter from rain. Scientists hope that these mechanics can help improve the capabilities of tiny robots that act as a swarm. 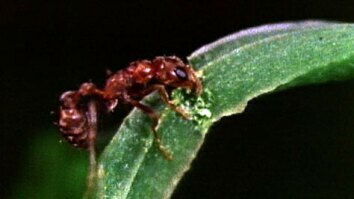 Click here to read See Fire Ants Create Towers From Their Own Bodies.